Ah, roguelike dungeon crawlers. The bread and butter of the indie gaming scene. For the most part, ‘roguelike’ nowadays just means permadeath and randomly generated dungeons. The gameplay of roguelikes does vary quite a bit, but there’s always the central mechanic of trying, again and again, to finally reach that goal. In this sense roguelikes are very arcadey; you go into the dungeon, get new gear, and go further in to try and reach that goal. There’s not usually much by way of story or character development. That’s where Moonlighter comes in. It’s a dungeon-crawler in which a merchant named Moonlighter braves the depths of a series of dungeons that magically popped up one day in order to reveal their secret. In the process, he gets better items for his store and builds up his business and his town. The first way Moonlighter departs from the typical roguelike formula is that it doesn’t emphasize combat as much. This is a welcome addition, considering the easiest thing to do in a game is tell the player ‘go fight x of this guy to get x of this item’. Moonlighter does feature its fair share of combat, but it’s broken up into two sections. The first is the dungeon crawling. Moonlighter does things in a fairly standard way here, but the standout for me is the combat, which can be pretty challenging. You need to get the timing right, and the top-down layout means you need to keep your eye on all four corners of the map. The second part of Moonlighter (and the part I consider to be the more interesting one) is the shopkeeping. Essentially, our young protagonist Moonlighter runs a store that’s existed for several generations. He stocks the store with the spoils from his dungeon runs, and he needs to keep it running smoothly. This means managing prices to keep profits healthy and customers happy. The way this works is pretty simple on the whole. Customers come in and peruse your wares. Eventually, a customer will focus on one item and pause for a while, and then a speech bubble will pop up showing an emoji face. If the face is frowning your goods are too expensive, if the face is ecstatic you’re basically giving it away, and if the face has a pleasant smile, it’s a fair price. I found the shop keeping aspect to be fairly engaging, as it urges you to be vigilant and observe customers as they come in and change your prices accordingly. The fact that Moonlighter gives you no real info about your items initially means you kind of have to take a stab in the dark initially and start from there. I got pretty invested in it, and I ended up getting frustrated if I was charging too much or too little. With your profits, you can upgrade the store to sell better items and give your customers more variety, or you can bring in new merchants to sell you items to make your dungeon crawling easier. The thing about Moonlighter that stuck with me the most is that it doesn’t feel like a dungeon crawler. The game’s intro, the dialogue, and the absolutely amazing soundtrack all give me the feeling that I’m playing some classic jRPG. Seriously, the soundtrack is phenomenal, and it meshes wonderfully with the brilliant and colorful pixel art. Moonlighter oozes charm, and it manages to set up an immersive gaming experience. However, it falls short before long, because it is ultimately an indie. It won’t take you long to get a foothold in Moonlighter, and inside of the first 2 or 3 hours you’ll have a ton of upgrades and you’ll be ready to take on the later levels without too much difficulty. I felt like it could have been a little more fleshed out in the end, but I figure Moonlighter still deserves a tip of the hat for drawing me in as long as it did. 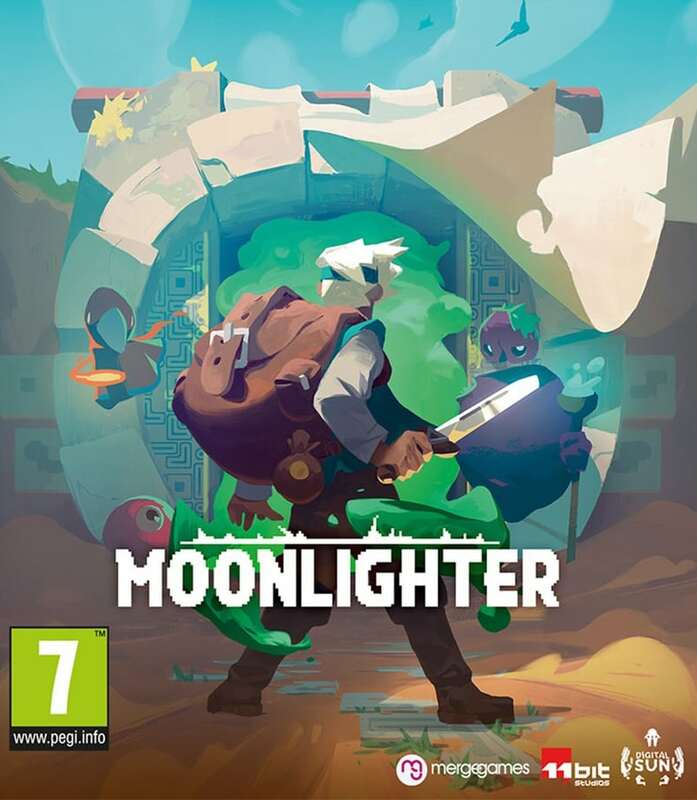 Moonlighter was reviewed using a PC digital download code provided by 11 Bit Studios. The game was tested on a PC running Windows 10, with an 8GB NVIDIA Geforce GTX 1070 fitted on a 4th Generation Intel i7 4790 3.6Ghz CPU and topped with 16GB of RAM. Moonlighter is also available on PlayStation 4 and Xbox One, and coming soon to Nintendo Switch via digital store releases. We don’t discuss review scores with publishers or developers prior to the review being published (click here for more information about our review policy).